I was very glad to come upon Deborah Tyler-Bennett’s collection. The slightly eccentric typefaces and layout caught my eye immediately; there’s something unusually approachable about the look of the book, something jaunty and refusing to take itself too seriously. Then there’s the way one poem follows another, occasionally sharing a page as though they need to keep coming without too much of a pause. I was perhaps sceptical, yet ready to accept the first poem’s invitation to ‘tune in today’. slaughtered by a falling door. As in other poems here, the tone hovers between elegy and comedy. I very much liked the way this poet is not afraid to record the sentimental gestures that often express or accompany genuine emotion. Never condescending, she mourns a world that is passing, but is always ready to surprise the reader with a chuckle or a choice moment of absurdity: the found poetry of a bingo holiday blurb, naff publicity churned out for the heritage industry. In ‘Impossible Journeys’, Tyler-Bennett’s happy ear for local vernacular combines to good effect with her avoidance of the “little words”, adding to the witty tone and allowing for a swift journey into the changing experience of life in the East Midlands, where many of the poems are set. (pungent putty to menu’s number three). Tyler-Bennett excels at portraiture. She pays homage to, among others, lace workers, miners and World War 1 soldiers, often deftly contrasting their workaday lives with starry aspirations and longings. I particularly enjoyed the woman who “ought to be in pictures”, the “silk scarf’s shift around the neck” suggesting a whole world of feminine detail. The poem ends with a touching vignette of her “small parents” in their “stippled wren house, not for peacocks”, described as “chestnut-faced deer surprised – producing a gazelle”. sized. Was once, we knew the bigger man. The book is organised thematically, with sections on Mansfield, a writing residency focussed on a First World War project, a Brighton section, and finally ‘Books, Films and Telly.’ I’m not sure that this always works to best advantage; the last part in particular might have come across more interestingly if integrated into the book as a whole. As it is, the themes of successive poems in this section start to seem a little predictable, which is a pity as there are amusing and touching pieces, for instance a found poem on Charles Dickens tourism, reflections on the pretension of a pet cemetery (“inscriptions craftsmen-carved from local rock”) as opposed to the injustice of other human deaths treated without respect (“baby in home-made box placed/in the grave of someone better-off”), and an update of ‘An Inspector Calls’ with reference to austerity Britain. This book is by no means just an enjoyable retro ride; Tyler-Bennett also turns her attention toward contemporary injustices. In ‘Faulty’, a poignant, ragged sonnet, she juxtaposes a homeless “gently-spoken boy” with a theatrical comedy poster; “crazy worlds turned upside-down”. A sonnet celebrating ‘Brighton’s Music Hall’ sparkles with the fun of rhyme; I was won over by the camp surface glamour: “glit-tery/chattery/latterly/skitter”. And Dusty (Springfield, of course) providing the “sobbing vocals” to mourn and memorialise lives and life-styles lost. Diseworth to Kegworth, Bleak House to Finger Farm. Wish I was in the business of restoring voices. Actually, I think she is. 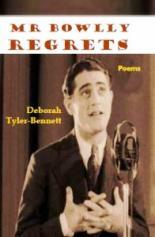 This is a collection I’ll return to, and Tyler-Bennett is a poet I would love to hear on stage. The poems are full of authentic voices pleading to be read aloud.